Turnberry Isle Resort and Club is situated on the Intercoastal Waterway within the lush surroundings of Adventura, an exclusive enclave in North Miami Beach. Ideally located twelve miles south of Fort Lauderdale International Airport and eighteen miles north of Miami International Airport, Turnberry Isle enjoys a reputation as a safe, secure destination. 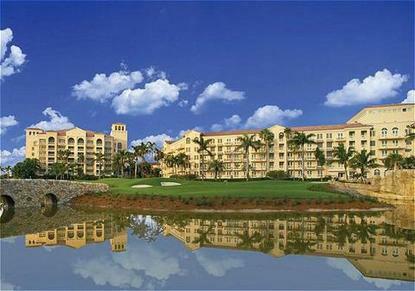 The soothing retreat-like atmosphere draws guests from all over the world to Turnberry Isle. Secluded on 300 tropical acres is a stunning Mediterranean-style hotel with a total of 392 luxurious guest rooms including 41 suites, two Robert Trent Jones 18-hole golf courses, 24 tennis courts, a 117-slip marina for deep sea fishing and charter yachts, and a private ocean club on the Atlantic with a beautiful beach, pool, cabanas, and watersports. For the fitness conscious, there's the Spa at Turnberry, with a diverse selection of restaurants from seaside casual to the award-winning Veranda Restaurant. Turnberry Isle was recently rated on of America's top resorts by the prestigious U.S. Zagat Hotel Resort and Spa survey. Survey participants gave Turnberry Isle rave reviews of "The best gourmet dining experience in Miami" and "the best rooms in the South. "-Renovations Information-Effective July 10, 2006 to Dec 15, 2006 inclusive - Hotel will be closed for complete refurbishment all guestrooms, conference center, Spa and fitness facilities, complete renovation of both 18-hole golf courses, swimming pool and private bungalows.